Getting started in ice fishing can be as easy or as hard as you want to make it. If you insist on catching lunker walleyes or lake trout, you may have to do a lot of moving and drill a lot of holes. But there are some species of fish that are easier to catch through the ice than others, mostly in the panfish family. One of these is the bluegill, generally eager biters at first ice. In the Midwest, we have several species of panfish and all continue to feed in winter. They may differ in size and color, but they all seem to like to nibble on baits such as wax worms, or plastic bait suspended below a jig or a bobber. In the winter, look for bluegills, and green sunfish in the shallower water. There are several reasons for this. They feed on small insects and larvae that live in areas where they find weed growth. Because of the shallow depth, the sunlight penetrates to the bottom in the shallower water until temperature turns very cold, and weeds continue to provide habitat for insects and larva. The weeds make ideal areas for the bluegill to locate and feed on small aquatic life. The panfish also like to hang out in the shallow water near these weed beds because the larger predator fish have a difficult time locating them and maneuvering in the shallow water and weeds. The GLO-SHOT® Jig is a luminescent jig that glows because of the Glo-Shot® Sticks placed in the jig that illuminates the entire jig for 8-plus hours. Anglers who have used it indicate the GLO-SHOT® JIG works great during the day for fishing under snow covered ice, during cloudy over cast conditions, in darker water and when fishing at night. It's reportedly very effective bait when tipped with a wax worm, minnow, or minnow head fished vertically, jigged, deadsticked or below a bobber. Opt for lighter, low-vis mono for this action. Lighter line has less memory and allows the lighter lures we use in ice fishing to flutter and rise naturally. Use small hooks or jigs and experiment with the number of wax worms you attach to the hook. There are times when bluegill will want just a tiny little wax worm and at other times, they will take an ice jig with two or more before they look at the smaller offering. The bobber or float helps you to detect the bite. Try to use as smallest bobber possible. The key to bobber fishing is to have just the very top of the bobber sticking out of the water; the less bobber floating out of the water, the less resistance the bluegill will feel when he takes the bait, holding on to it longer. I like to use the Northland LITE-BITE ICE FLOAT. The 3" and 5″ foam Hi-Vis float comes with its own bobber stop. It's adjustable by unscrewing the corkscrew base and trimming the foam back so it barely floats. 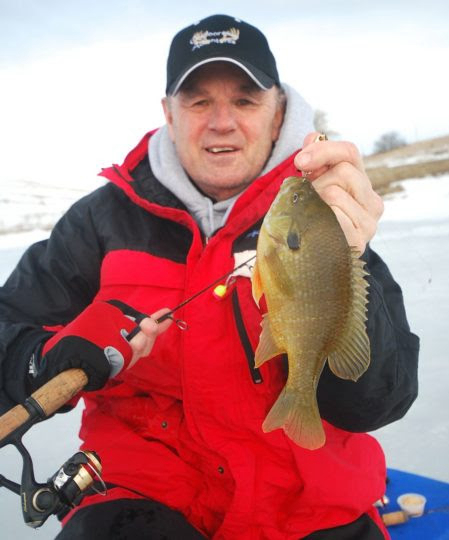 Fish during winter will move vertically as much as they do horizontally, so if you were catching bluegills at 3 feet, and the bite quits, do not move to a next spot too soon. Try going a bit deeper if the sun is out or a bit shallower if it is a cloudy day. Bluegill and other panfish are fun to catch and great eating, especially when caught from ice-cold water. Limits are liberal, and there are lots of them around in most lakes and ponds--give it a try before spring warmup. Gary Howey, a Watertown native now residing in Hartington, Neb. is a former tournament angler and fishing & hunting guide. He was inducted into the National Freshwater Fishing Hall of Fame in 2017. He is the Producer/Co-Host of the Outdoorsmen Adventures television series. If you are looking for more outdoor information, check out garyhoweysoutdoors.com or like Gary Howey’s Outdoorsmen Adventures on Facebook or watch his shows on www.MyOutdoorTV.com.